new shots from Thomas’s show added to flickr. click below. Tom the space with your texture fields looks interesting both from the photo’s and video. I will be by to see them inperson before you take the show down, but I like the muted organic quality they yield. It’s worth seeing in person. The photos are great but they don’t give justice to the experience you feel once you’ve walked in the space. 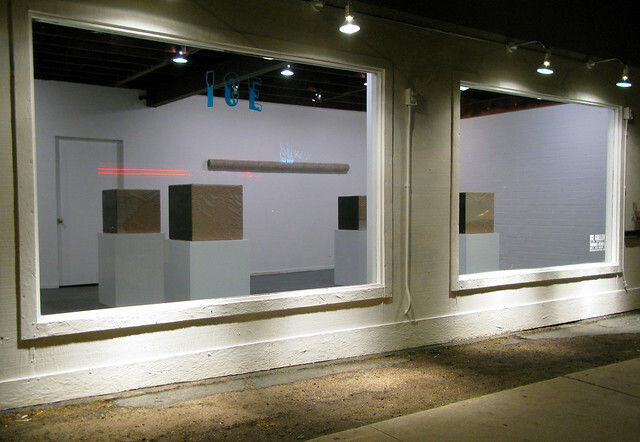 As for the gallery itself, I remember buying dry ice at this place. It’s great to see a gallery in what was once a run down building – keep up the great work! thanks mike! guess what, the building is just as run down as ever…at least in the back. we’ve done our best to mask the front space though. we’re glad you enjoyed it.